If you are looking for paradise you have found it on the Oahu Hawaii North Shore! Beachfront backyard bungalows are located on Sunset Beach in the heart of the world famous North Shore on a private sand beach that stretches miles in both directions. One of the most desirable beaches in the world, as seen on Travel Channel’s top 10 Beaches numerous times. Home is perfect for those looking for a relaxing, exciting, perfect vacation. Tucked back in a quiet neighborhood off the bike path. Whether you are looking to catch a wave, hang in the hammock with a book, snorkel/scuba dive the gorgeous reefs, grill out your fresh catch, bask in the sun, North Shore has whatever a perfect vacation entails to you! 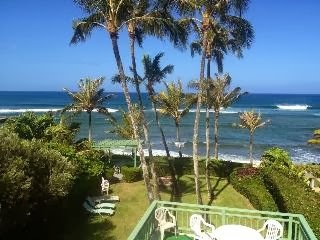 World class surf break “Backyards” directly in the back yard of house with “Sunset” “Rocky Point” and “Pipeline” in view from the property and steps away! The beach in front of the house is absolutely breathtaking and hardly used as there is no public access to it close to the home! The water is crystal clear and the snorkeling is great.